Sleep is one of the most critical factors driving good health, and if you aren’t sleeping as well as you should be, every area of your life will be impacted in a negative way. For beginners, nothing ages you faster than a lack of quality sleep. 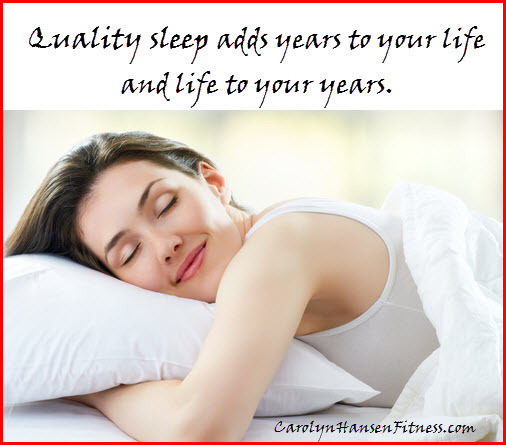 In fact, quality sleep could easily be considered the fountain of youth. Not enough quality sleep a few nights in a row and your complexion begins to look lackluster and you’ll likely have some bags around your eyes. Just one night of insufficient sleep can slow down your metabolism, making fat loss much more challenging. Those who suffer with sleep quality deprivation will not have strong immune systems and the risk for heart disease, diabetes and stroke increase. Without the strong defenses needed to fend off invading bacteria and viruses, they will likely fall ill more often. Furthermore, the immune system plays a vital role in keeping oxidative damage down. If its weakened, oxidation takes place, causing you to age far more quickly than you otherwise would. Sleep deficiency alters activity in parts of the brain. When you are tired and your body suffers with lack of quality sleep your brains’ ability to keep the nervous system clear is impaired. You may have trouble making decisions, controlling emotions and behavior, solving problems, and coping with change. Lack of quality sleep has also has been linked to risk-taking behavior, depression and even suicide. A weakened and tired mental state also directly influences your ability to stick with your diet and workout protocol. Feeling fatigued from lack of sleep is the quickest way to crush any desire to get your workout in for the day ahead or tackle any new activity you had planned. Too little sleep means your body is more likely to store carbohydrates as body fat rather than burning then up for energy or devoting them towards building lean muscle mass tissue. If your brain is lacking energy from not getting enough sleep, it often turns to food for that energy. Truth is, poor sleep messes with your hormones. It increases the production of ghrelin (your hunger hormone). Too much ghrelin causes your body to crave fatty and sugary foods, not a good state to put your body in. Poor sleep also messes with leptin your satiety hormone. Bottom line is: when you lack sleep, you tend to eat more of what you are craving because your hunger hormones are messed up and you’re not feeling the signals to stop eating. When you are consciously asleep, your body is working overtime in repair mode fixing all the damage that took place in your body throughout the course of the day. Sleep is when your body goes to work repairing and replacing. Without enough time devoted to sleep, your body won’t be able to repair itself or recover as quickly from your daily activities or workouts and any further progress is you would otherwise experience will be compromised. Remember, it’s not just sleep you need, but quality sleep you’re after. You always know when you’ve gotten a quality night’s sleep because when you wake you feel good and ready to tackle the day. Truth is, you can take control of the aging process and add years of good health and quality living to your lifespan by paying attention to a few critical players beginning with quality sleep. Sleep quality is a good place to start because it directly influences your energy level. As your energy level increases, your physical performance increases. This in turn increases your weight loss results which in turn boosts your appearance making you feel much happier overall. Bottom line is this: the way you feel while you’re awake depends in large part on what happens while you’re sleeping.